A standing ovation goes out to former Amabile Youth Singer, Lisa Helps who just became the Mayor of Victoria! As a student at St Mary’s Choir School, Lisa joined the JAS in 1990 and moved to the AYS just a year later. Her fellow students at CCH remember her as very active in sports as well as music. The focus and dedication she learned as a member of the AYS for half a decade would pay dividends when it came to education: Her academic work, includes a completed master’s and unfinished PhD on a history of housing, homelessness and the governance of poverty in Victoria. 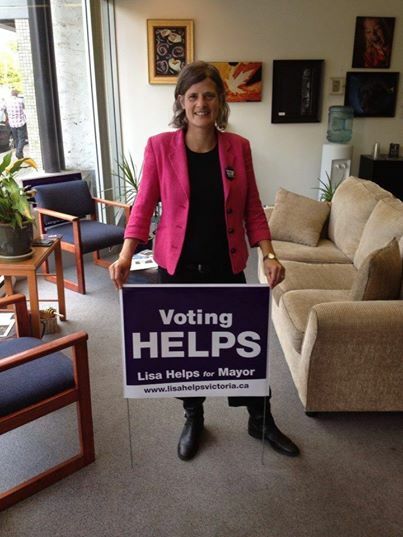 In 2011, after more than 12 years of community leadership that has created affordable housing, new businesses, community facilities and gardens in Victoria, Lisa Helps, then the Founding Executive Director of Community Micro Lending Society, won a seat on City Council. Lisa describes her politics as ‘people centred,’ She adds that she’s proactive, collaborative and has a “21st century” style of leadership. In Victoria’s recent municipal elections, Helps defeated Dean Fortin, Victoria’s two-term mayor, winning by just 89 votes. Bravo, Lisa. Amabile is so very proud of you! I hope Lisa is aware of the need for a decent “performing arts centre” in Victoria. I know this is a well-worn cry in London. I have no idea where people perform in Victoria, or whether there is adequate space.